I’ve been trying to explore the YA genre for stom time, but it hasn’t been a big success till now. The books in this genre look so good and the change in genre can at times spice my reading up. Sadly, the books don’t do it often for me. Though this book was a gem! What a great book! I can understand the whole hype about this book/series now! I highly enjoyed the world this was set in. The world of fearies combined with others ‘monsters’, and the different courts was a very good choice. The fearies aren’t stuck to one sort/image, but can be put into groups that fit the different courts. Different styles of fearies, not the basic being nice and protective, perfect creatures. We see the dark side of fearies (are they actually having a dark side? ), which I really enjoyed. The different courts are very imaginative. It’s easy to see the courts in front of you, being known with the seasons and changes of the day. That made it very possible to bring the book to live in my head. The characters were very different from each other and extremely likeable. As basically any YA book, it has a couple of pretty characters to get crazy over: Tamlin, Lucien and the bad guy Rhysand. We already know that Rhysand isn’t going to be the guy we thought he was. I’m curious about how he ends up to be exactly. Our head character is Feyre. Feyre is a very strong and independent girl. I loved how she first hated it at the court, but later found her way there and actually seemed to become more of a stranger to her own family and fit with the faeries at the court. I’m very curious about the character development in the other books and which new characters we will meet. This is the first book in the series, and this whole story/universe has so much potential for a series. 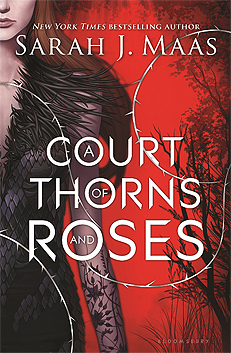 Sarah J. Maas can make so many books about all of the courts and different faeries. Which is what she is doing right now. I’m no doubt going to read the other books of this series some time. It’s nice that it doesn’t have a big cliffhanger, but does show the possible path the next books are going to take and make you want to read it. I gave this book 5/5 stars. Have you read it? What do you think about this book? Let me know in the comments!